Isla Holbox was inhabited by Mayas in the pre-Hispanic era. Silent witnesses of this fact are the remains of the Yoluk ceremonial center in the heart of the island and along the bank of the Yalahau Lagoon. This site was abandoned and still has not been reconstructed by archeologists. Holbox forms part of the territory dominated by the Ekab tribe, whose center was on the mainland, across from Isla Contoy. 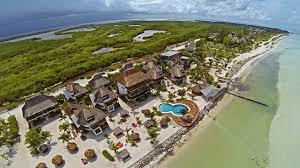 While the Spanish expedition led by explorer Juan Diaz de Sous was the first to lay eyes on and navigate around Isla Holbox Island in 1509, the �Advance� Francisco Hernandez de Cordoba was he first European to set foot on the island in 1517. "... when Francisco Hernandez de Cordoba arrived in this country landing on the end of the island called Cape Catoch, he found some fishermen and asked them what country it was, and they answered "Catoch" which means "our homes and our homeland," reason why it was named Cape Catoche. He asked for further proof of their land ownership, they replied "uh t'ann ka yu" which means "listen how they talk" and the Spanish called it Yucatán because this is what one of the old conquerors Blas Hernández understood the first time along with the Advance... "
From the sixteenth to nineteenth century, pirates and buccaneers ravaged the Gulf of Mexico and the Caribbean Sea. Often they were looking for shelter, food and water in Yalahau Lagoon. Another famous personality to visit Isla Holbox in 1842 was John L. Stepehens. The American researcher, explorer and writer, with his findings, was the precursor of modern research of the Mayan culture. In 1847 and after centuries of exploitation, oppression and humiliation, there was a bloody uprising of the Maya against the white and mestizo residents of the Yucatán Peninsula, the so-called "Caste War." Except Merida, which was sieged, the city of Campeche and the Islas Cozumel and Mujeres, the entire east and south of the peninsula remained in the control of the Maya. At this time that Holbox’s population increased significantly, as it received many survivors who fled the Mayan social rebellion. In 1886 a major hurricane completely destroyed the old village of Holbox, so its inhabitants decided to rebuild the town a few miles to the east on the island, where it is today. Because of bickering, backstabbing and internal power struggles between warlords Cecilio Chi, Jacinto Pat and their successors, the rebels had to retreat until they were finally defeated in 1901 with the seizure of the town of Chan Santa Cruz. In 1902 the Federal Territory of Quintana Roo was established and in 1910 Holbox became a municipality. In 1921 it was incorporated into the municipality of Isla Mujeres. While the political importance of Holbox decreased, its inhabitants were devoted to the production of copra (dried coconut meat) and, as always, fishing. Towards the end of the twentieth century, Isla Holbox began to be known as a peaceful tourist destination and for its natural attractions. The remoteness and isolation that have surrounded Holbox, demonstrates the strength of its residents who have lived on the edge of civilization and faced throughout its history not only in times of poverty, but sometimes the strength of hurricanes.